Game: Dead Space 3Note: Dead Space 3: Awakened takes place after the events of Dead Space 3. If you haven't finished the game, and don't want anything spoiled just skip to the verdict to find out how the product fares. 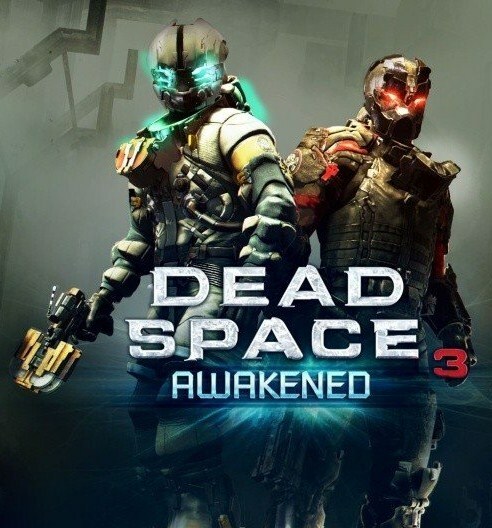 Awakened takes place right after the conclusion of Dead Space 3, and reveals the fate of Isaac Clarke & John Carver whom are very much alive after their ordeal in the vanilla game. After bringing down the moon, the two friends must find a way off of the now devastated Tau Volantis. Along the way, they start hallucinating pretty badly and start seeing things that aren't really there. Fans will be happy to see Isaac suffers from these again after having it "cured" during the events of Dead Space 2. Sadly, the DLC doesn't reveal how he's seeing these things again, but along the way tensions rise between both Isaac and Carver. They soon find out that after Danik died in the story of Dead Space 3, a new leader has emerged to form a Unitologist Cult, and he's essentially a mutilated man covered in what seems to be Necromorph limbs. He's terrifying to look at, and to encounter. He appears mainly in hallucination scenes and has this weird "phasing" walk where he'll appear for a mere moment, and vanish again. Very similar to Alma from the FEAR series and it captures horror perfectly. This guy is downright terrifying, and it made everything "uneasy". Not to mention he can Stasis you which can be a pretty bad thing when his followers, or Necromorphs are around. The cult leader who seems to be called "Heretic". He's scary. Truly scary. Eventually, you'll leave Tau Volantis and have to head back to the Terra Nova ship from the Dead Space 3 campaign and attempt to repair the ship, and head back to Earth to warn the planet of an oncoming attack from other Moons because it turns out that they know where Earth is after-all which essentially makes the entirety of Dead Space 3 pointless, and you'll eventually come to find out that Awakened is the "true" ending for Dead Space 3, and opens up the possibility of a Dead Space 4 (which from the ending I'd love to see that happen). The story doesn't make much sense in Awakened, and it doesn't really explain anything, thus providing a handful of plot-holes. How did Isaac & Carver survive falling to Tau Volantis, and having the Moon hit the planet as well? The DLC doesn't reveal that, and Isaac keeps bringing up "Maybe the Aliens saved us" and to me that just seems stupid. Maybe Visceral Games will reveal how they survived in future DLC, or in the next installment of Dead Space (if it gets developed). That, and how this "Heretic" guy was so quick to take over the lead of the Unitologist's, unless he was already second in command and went nuts just like everyone else from when the Moons broadcasted their arrival. But hey, that's just me speculating. They really don't reveal anything, other than the Moons are coming, and they're going to Earth. Aside from the silly plot, this DLC feels great and brings back a classic Dead Space experience like I remembered having while playing the first game in the franchise. It's creepy, and the hallucinations work perfectly this time around. Warping your screen, showing dead friends, and even in one instance pitting you against your friend, or so you think. Really adds a new layer to the co-op, and I really dig that and still proves that co-op works perfectly in Dead Space. The new enemies are really great too. We see some Necromorphs that we haven't seen since Dead Space 2, which is the Pack. Which are essentially children-like Necromorphs that swarm you, and jump around like crazy. I really missed these guys, and seeing them again brought back memories from my favorite Dead Space game. Even the human enemies are perfect this time around, they don't carry and fire-arms (thank-god) but instead have had their arms, or hands cut off and replaced with either Necromorph limbs, or blades, I couldn't really tell because I was too busy trying to kill them. Really added a great new element because you're fighting psychotic, cultists who want nothing more than to chop you up into tiny bits. They creeped me out. Just an example of the some of the new enemies you'll encounter. The environments are also bang-on as well. Aside from more blizzard-like and hard to see conditions on Tau Volantis, we get a completely redesigned Terra Nova which has been taken over by said cultists, and it really shows. Crucified Necromorphs & humans cover the hallways, with only candles decorating the hallways. They essentially took the ship, and turned into a Unitologist Church but in a more extreme sense. You feel completely uneasy, and helpless moving through these tight, narrow hallways and I expected all of the crucified, and hanging corpses to leap off the wall and attack me. Environmentally, this DLC blew my socks off. Nailed the horror aspect right on the head. 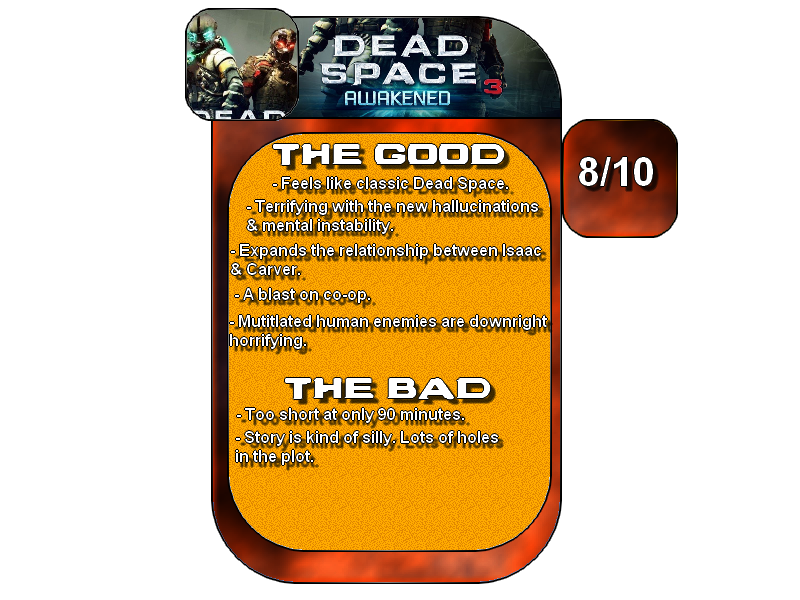 So, in essence Awakened brought back a classic Dead Space experience that any Dead Space fan should enjoy. It adds new layers to the co-op, adds new achievements, brings out some crazy, and disturbing environments and most of all it's pretty damn scary. The only downside is that you'll finish it in about 90 minutes - 2 hours and some people may think that's pretty steep for $10, but in all honesty I'm really happy with the final product. I'll be playing through it again Solo to see how the experience changes, but as a co-operative experience it's just as good as Dead Space 3.